In just over a week, my family and I will be packing our bags, loading up the van and driving to Florida for a vacation. Since we don’t have unlimited funds, we’ve been saving money for months to pay for our trip. Budgeting our trip to fit within the funds that we have is just part of our planning process to ensure we don’t go into debt to pay for our vacation. But as careful as we are, sometimes there are expenses that slip through the cracks and put us in a mode of having to revaluate our spending plan on the fly. Whether you’re driving across the country or to a nearby airport, the cost of gas to get there and back is an expense that should go into the vacation budget. The further you’re driving, the larger of an expense it is. Since the price of gas fluctuates, you may have to recalculate this expense several times leading up to your trip dates. On our drive to and from Florida, we’ll be staying in several hotels. While my wife has worked hard to get us the very best price for these accommodations, they still need to be part of the spending plan. We usually allocate an amount per day to spend while at our destination. But we also have to make sure we take into account meals needed while traveling. This is several days worth of meals for our trip, but even when traveling by plane there may be an airport meal or two that needs to be accounted for. If traveling by car in an unfamiliar area, you may encounter toll roads. This is easy for me to overlook because we don’t have toll roads anywhere in the area in which I live. But, traveling through other major metropolitan areas on our way to Florida will require tolls. It’s a good idea to research your route, and find out whether any toll payments will be required. If traveling by plane, the cost of your airline ticket will not be sufficient to get you to where you’re going. Most airlines will charge for some or even all of your checked luggage. Some airlines now even charge for carry on bags. Research the policy of the airline you’re using, and know ahead of time how much you’ll be paying to transport your luggage. Whenever I’m going on a vacation, I have an amount allocated that can be used for unplanned expenses, or when things end up being more costly than expected. It can also be used for vacation activities you hadn’t planned on but would like to add to the spending plan. For example, once in Florida maybe I’ll decide I really want to go para-sailing, or rent a jet-ski. It’s not in our original spending plan, but it sounds like fun. Thank you slush fund! Going on vacation is supposed to be a break from the hustle and bustle of every day life. Taking a break from budgeting and being mindful your spending is never a good idea. But by carefully and accurately planning your expenses, you can put your spending on cruise control, and enjoy your vacation to the fullest. 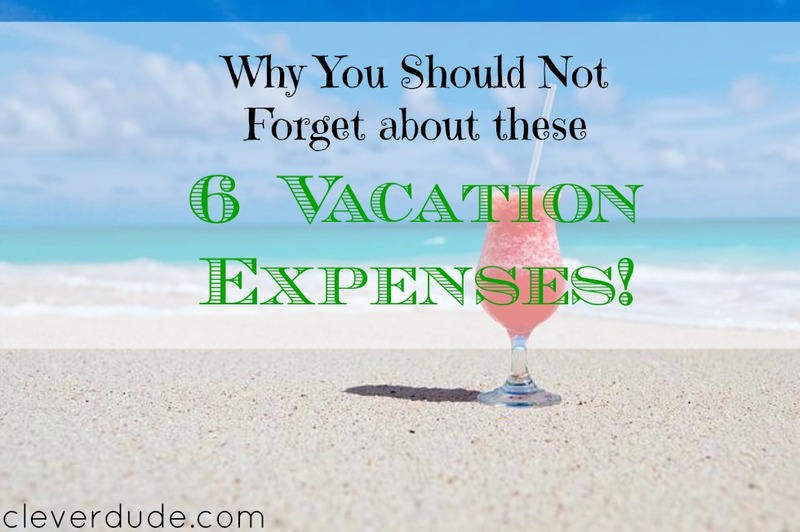 What vacation expenses have you forgotten about? Did you have to reshuffle your vacation spending because of it? Souvenirs! Though they are completely ridiculous and a huge waste of money while you are there, years later you may look at those silly things and think fondly on your trip. Sometimes family appreciate or even expect something from your trip, so don’t forget about them. You can also double up and do birthday/Christmas shopping to try to be more frugal with it. Plus one on souvenirs. Also, I find there’s invariably something I’ve forgotten or run out of, like toothpaste or sunscreen. I know your slush fund will take care of either of these thing, but I generally expect to spend $40-50 on souvenirs and at least $10 on something we’ve forgotten. Sounds like we think alike, Emily! There’s always something forgotten for a vacation, isn’t there???? Great tips! Another nice thing to think of for cost savings. Try to get a hotel close to where you’re doing all your activities, especially if you’re flying. Then you don’t have to pay for a taxi, or a rental car even if the price of the hotel is more expensive it saves you money. Transportation can KILL a budget. I can get a good deal on a rental car if needed through my employer discount, but I agree with you – if one can stay nearby to where there’s a lot to do, big savings can be had just by walking OR using simple public transportation! We always forget about toll roads! Sometimes that expense can really add up!!! Yes it can, Lisa! Our trip to Florida added another toll bridge this year…$4 in each direction. Not a huge amount of money, but something that we have to account for! Great tips! Nobody wants to be stressed out because of all these extra fees that add up. Plan ahead and actually enjoy vacation without worrying about money! Exactly, Bill! Sitting in a hotel room doing nothing because you ran out of money isn’t a very fun vacation. We have a savings account specifically for our travel/vacation needs. That way we know what is in the account is what we can actually spend. Sounds good, Kelly…but I hope you’re actually mapping out your vacation spending so you know you have enough to cover the expenses and activities you plan to do during your vacation! I always seem to forget to bring something. For the beach, this is always a beach towel and sunscreen, every time, without fail! I have both of these items at home and shouldn’t have to buy them at my destination at a higher price! I like fueling up at Sam’s Club gas stations on road trips. They’re usually the cheapest in the area. I think slush funds are an awesome idea! Especially for all the little hidden fees and taxes within things. I feel like those pop up unexpectedly a lot! Yes, they do Mel! My son and I were planning on doing jetskis for 30 minutes….but we decided to do an hour instead. It was more expensive, but we had the cash to do it thanks to the vacation slush fund! Having someone take care of the animals/house while you are away can really add up, too! Oooh, true story, Barb! Even having a neighbor kid come over and feed our mainly self-sufficient cats did have a price tag!